The reality is the majority of graduates will face some level of rejection when applying for a job. Successful Graduate has covered what you can learn when your resume gets rejected, but this post will look at how to deal with job interview rejection. We’ve said this before in a variety of different ways, but at its base, when you apply for a job, you’re telling an employer you’re the best candidate for the role. Unfortunately, sometimes employers don’t agree with you. Simple maths tells us the path towards getting a job is paved with those who were deemed less suitable than other candidates. If you scored the job, congratulations! But remember, upwards of 50-100 people also applied for the job, with most not receiving an interview and only one person, you, succeeding. We’ve also spoken before about the fact you’ll likely submit a high number of applications without receiving an interview. That level of rejection can be annoying, disheartening and it will build up over time, but a rejection from a job interview is completely different. Going from paper to actual person-to-person interaction can make rejection that much harder because it can personify the rejection. Overcoming one hurdle to be stopped by another can also be agonising, because you were so close yet so far. Why did I get an interview? Changing the question around is important for a few reasons. Firstly, doing so allows you to view your achievements positively. The fact you got an interview is something to be acknowledged, even if the end result wasn’t what you preferred. Secondly, by focussing on the strengths that helped you get to interview, you will have a better understanding of what you need to do to get to the next interview and succeed. In many cases, the difference between being the best fit and not (because every candidate who interviews is the right fit) can be the sum of many small attributes. If you know why you got an interview, you now have a path upon which to improve the small elements to make you more likely to get hired. Thirdly, remaining positive is important throughout the entire process to maintain enthusiasm and continue moving from graduation to employment. For those of you who are just starting to look for the first job after education, it can be a long road. You need to celebrate the small victories so you can get to the big ones. It is important to reflect on interviews and think about what can be done to improve, but it is equally important see rejection after a job interview not as a failure, but an opportunity to learn more about yourself. Many employers will provide interview candidates and some resume applicants with feedback. Where possible, embrace that opportunity and make sure to not only ask how you can improve for the future, but what characteristics the employer liked. Understand your strengths and build on them. Use your strong areas as a launching off point to expand to other skills sets and become more employable. 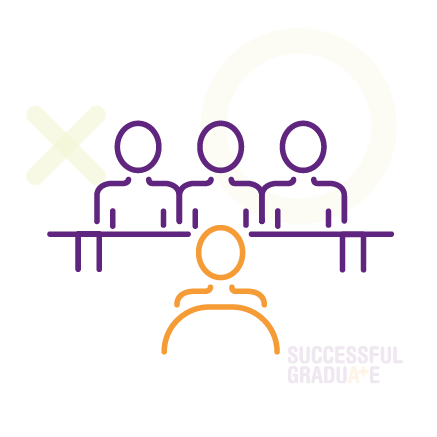 Successful Graduate helps you understand your strengths and value proposition so you can start improving your chances of finding your first job out of uni. Sign up today and start learning why you are a successful graduate.